Event-Cast allows you to webcast your local events live on the Internet. With Event-Cast webcasting your events is fast, easy, and affordable. Really! An iPhone, iPad or an iPod Touch, and a connection are all you need to let friends, family and fans watch your events from anywhere in the world on PCs, Macs, iPhones and Androids and other devices. All you need to do is select the time and date of your event and choose the number of connections. Need to be more spontaneous? No problem. You can create a webcast that's ready to go in just a couple of minutes. And with our Facebook, Twitter, Email, SMS Text, Blog and Website integration, you can get the word out quickly! A PC or Mac with Flash installed, an iPhone, iPod Touch or iPad with the Event-Cast app installed. or Safari, or just about any Android tablet or smartphone. 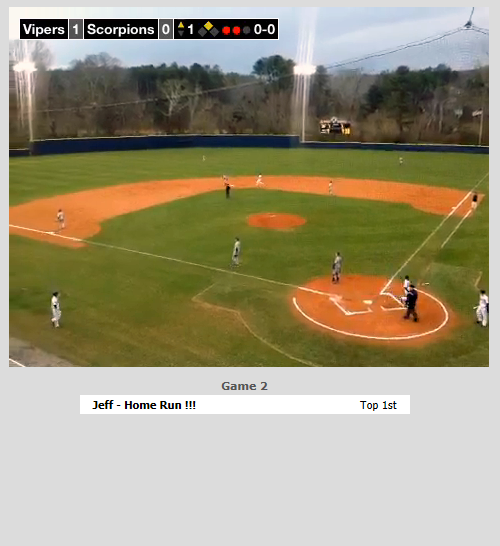 If you are webcasting a sporting event, you can enhance the experience by creating an optional scoreboard for baseball, basketball, football, volleyball, softball, soccer, hockey, or lacrosse. 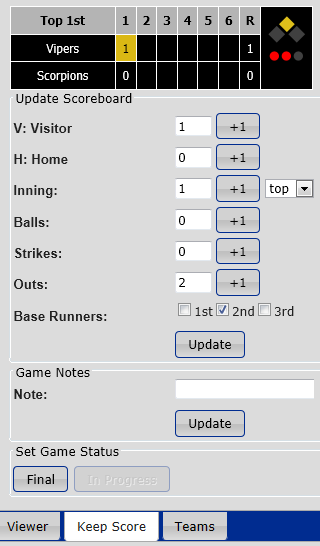 Event-Cast gives you a scoreboard control panel which you can update, enter team names and notes. When you update your scoreboard your viewers will be able to see the updated score of the game and optional game notes while viewing your webcast. We make it easy to add a logo to the corner of the screen, to help you promote your club or teams brand. Look at the images below to see a scoreboard example. You update the scoreboard... Your viewers will see this! Pricing for events depends on duration of the webcast and how many simulataneous devices you want to be able to view your event. Once a webcast is available an Event-Cast.com account is not required to watch or listen to your event. Click on the button below to get detailed pricing. Want to try it out. We offer a free trial webcast. Of course, when you have a webcast you'll want to be able to share your event with your family, friends or fans. With Event-Cast you have multiple ways to get the word out. You can post your event on Facebook, Twitter, we'll send you a link you can share via Email, or you can list your event in Event-Cast guide. Want to limit access - you can do that too. You can give your event a password and limit viewers to only those that have the password. Kensington PowerLift Backup Battery and Dock (non-lightning dock connections) A small stand and portable battery charger useful for webcasting from an iPhone or iPod Touch. Joby Gorillapod Flexible Tripod A small portable tripod. Stand with Mini Tripod Mount Adapter for iPhone 4G Useful as a way to attach and iPhone to a tripod. Grifiti Nootle Ipad Tripod Mount (For 2, 3, and 4) with 1/4-20 Thread to Fit Any Standard Head You Already Use For attaching an iPad to a tripod. Olloclip 3-in-1 Lens for iPhone 4 & iPhone 4S Primarily useful as a wide angle lens for webcasting, increases the area which can be seen in a webcast. Olloclip 3-in-One Lens System for iPhone 5 - Black Primarily useful as a wide angle lens for webcasting, increases the area which can be seen in a webcast.